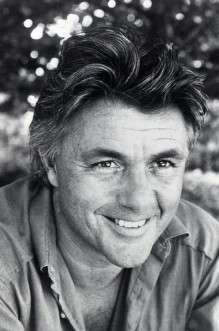 For other people named John Irving, see John Irving (disambiguation). John Winslow Irving (born John Wallace Blunt, Jr. on March 2, 1942) is an American novelist and Academy Award-winning screenwriter. Irving achieved critical and popular acclaim after the international success of The World According to Garp in 1978. Some of Irving's novels, such as The Cider House Rules (1985), A Prayer for Owen Meany (1989), and A Widow for One Year (1998), have been bestsellers. Five of his novels have been adapted to film. Several of Irving's books (Garp, Meany, A Widow for One Year) and short stories have been set in and around Phillips Exeter Academy in Exeter, New Hampshire. He won the Academy Award for Best Adapted Screenplay in 1999 for his script The Cider House Rules. Irving was born John Wallace Blunt, Jr. in Exeter, New Hampshire, the son of Helen Frances (née Winslow) and John Wallace Blunt, Sr., a writer and executive recruiter; the couple parted during pregnancy. Irving grew up in Exeter, as the stepson of a Phillips Exeter Academy faculty member, Colin Franklin Newell Irving, and nephew of another, H. Hamilton "Hammy" Bissell (1929). Irving was in the Phillips Exeter wrestling program both as a student athlete and as an assistant coach, and wrestling features prominently in his books, stories, and life. Irving's biological father, whom he never met–even if the latter was, from time to time and on purpose, attending his son's wrestling competitions–, had been a pilot in the Army Air Forces and during World War II was shot down over Burma in July 1943, but survived (an incident incorporated into the novel The Cider House Rules). Irving did not find out about his father's heroism until 1981. Irving's career began at the age of 26 with the publication of his first novel, Setting Free the Bears (1968). The novel was reasonably well reviewed but failed to gain a large readership. In the late 1960s, he studied with Kurt Vonnegut at the University of Iowa Writers' Workshop. His second and third novels, The Water-Method Man (1972) and The 158-Pound Marriage (1974), were similarly received. In 1975, Irving accepted a position as assistant professor of English at Mount Holyoke College. Frustrated at the lack of promotion his novels were receiving from his first publisher, Random House, Irving offered his fourth novel, The World According to Garp (1978), to Dutton, which promised him stronger commitment to marketing. The novel became an international bestseller and cultural phenomenon. It was a finalist for the National Book Award for Fiction in 1979 (received by Tim O'Brien for Going After Cacciato) and its first paperback edition won the Award next year. [lower-alpha 1] Garp was later made into a film directed by George Roy Hill and starring Robin Williams in the title role and Glenn Close as his mother; it garnered several Academy Award nominations, including nominations for Close and John Lithgow. Irving makes a brief cameo in the film as an official in one of Garp's high school wrestling matches. The World According to Garp was among three books recommended to the Pulitzer Advisory Board for consideration for the 1979 Award in Fiction in the Pulitzer Jury Committee report, although the award was given to The Stories of John Cheever (1978). Garp transformed Irving from an obscure, academic literary writer to a household name, and his subsequent books were bestsellers. The next was The Hotel New Hampshire (1981), which sold well despite mixed reviews from critics. Like Garp, the novel was quickly made into a film, this time directed by Tony Richardson and starring Jodie Foster, Rob Lowe, and Beau Bridges. "Interior Space", a short story published in Fiction magazine in 1980, was given an O. Henry Award (and thus collected in its eponymous anthology from 1981). In 1985, Irving published The Cider House Rules. An epic set in a Maine orphanage, the novel's central topic is abortion. Many drew parallels between the novel and Charles Dickens' Oliver Twist (1838). Irving's next novel was A Prayer for Owen Meany (1989), another New England family epic about religion set in a New England boarding school and in Toronto. The novel was influenced by The Tin Drum (1959) by Günter Grass, and the plot contains further allusions to The Scarlet Letter (1850) by Nathaniel Hawthorne and the works of Dickens. In Owen Meany, Irving for the first time examined the consequences of the Vietnam War—particularly mandatory conscription, which Irving avoided because he was a married father when of age for the draft. Owen Meany became Irving's best selling book since Garp, and is now a frequent feature on high school English reading lists. Irving returned to Random House for his next book, A Son of the Circus (1995). Arguably his most complicated and difficult book, and a departure from many of the themes and location settings in his previous novels, it was dismissed by critics but became a national bestseller on the strength of Irving's reputation for fashioning literate, engrossing page-turners. Irving returned in 1998 with A Widow for One Year, which was named a New York Times Notable Book. Irving has had four novels reach number one on the bestseller list of The New York Times: The Hotel New Hampshire (September 27, 1981), which stayed number one for seven weeks, and was in the top 15 for over 27 weeks, The Cider House Rules (June 16, 1985), A Widow for One Year (June 14, 1998), and The Fourth Hand (July 29, 2001). In 1999, after nearly 10 years in development, Irving's screenplay for The Cider House Rules was made into a film directed by Lasse Hallström, starring Michael Caine, Tobey Maguire, Charlize Theron, and Delroy Lindo. Irving also made a cameo appearance as the disapproving stationmaster. The film was nominated for several Academy Awards, including Best Picture, and earned Irving an Academy Award for Best Adapted Screenplay. Soon afterward, Irving wrote My Movie Business, a memoir about his involvement in creating the film version of The Cider House Rules. After its publication in 1999, Irving appeared on the CBC Television program Hot Type to promote the book. During the interview, Irving criticized bestselling American author Tom Wolfe, saying Wolfe "can't write", and that Wolfe's writing makes Irving gag. Wolfe appeared on Hot Type later that year, calling Irving, Norman Mailer, and John Updike his "three stooges" who were panicked by his newest novel, A Man in Full (1998). When Irving's 10th book, The Fourth Hand (2001), was published it became a bestseller. A Sound Like Someone Trying Not to Make a Sound (2004), a children's picture book originally included in A Widow for One Year, was published with illustrations by Tatjana Hauptmann. Irving's novel, Until I Find You, was released on July 12, 2005. On June 28, 2005, The New York Times published an article revealing that Until I Find You (2005) contains two specifically personal elements about his life that he had never before discussed publicly: his sexual abuse at age 11 by an older woman, and the recent entrance in his life of his biological father's family. In his 12th novel, Last Night in Twisted River, published in 2009, Irving's central character is a novelist with "a career that teasingly follows Irving's own," as one journalist put it (e.g., including the aforementioned reference to Irving's own avoidance of mandatory conscription). Since the publication of Garp made him independently wealthy, Irving has been able to concentrate solely on fiction writing as a vocation, sporadically accepting short-term teaching positions (including one at his alma mater, the Iowa Writers' Workshop) and serving as an assistant coach on his sons' high school wrestling teams. (Irving was inducted into the National Wrestling Hall of Fame as an "Outstanding American" in 1992.) In addition to his novels, he has also published Trying to Save Piggy Sneed (1996), a collection of his writings including a brief memoir and unpublished short fiction, My Movie Business, an account of the protracted process of bringing The Cider House Rules to the big screen, and The Imaginary Girlfriend, a short memoir focusing on writing and wrestling. In 2010, Irving revealed that he and Tod "Kip" Williams, director and writer of The Door in the Floor (2004), are co-writing a screenplay for an adaptation of A Widow for One Year (1998). In recent years, his four most highly regarded novels, The World According to Garp, The Cider House Rules, A Prayer for Owen Meany, and A Widow for One Year, have been published in Modern Library editions. Owen Meany was adapted into the 1998 film Simon Birch (Irving required that the title and character names be changed because the screenplay's story was "markedly different" from that of the novel; Irving is on record as having enjoyed the film, however). In 2004, a portion of A Widow for One Year was adapted into The Door in the Floor, starring Jeff Bridges and Kim Basinger. In a New York Magazine interview in 2009, Irving stated that he had begun work on a new novel, his 13th, based in part on a speech from a play by Shakespeare, Richard II. Simon and Schuster published the novel, titled In One Person (2012), taking over from Random House. In One Person has a first-person viewpoint, Irving's first such narrative since A Prayer for Owen Meany (Irving decided to change the first-person narrative of Until I Find You to third person less than a year before publication). In One Person features a 60-year-old, bisexual protagonist named William, looking back on his life in the 1950s and '60s. The novel shares a similar theme (and concern) with The World According to Garp, which was, in part, says Irving, about, "People who hate you for your sexual differences." He won a Lambda Literary Award in 2013 in the Bisexual Fiction category for In One Person, and was also awarded the organization's Bridge Builder Award to honor him as an ally of the LGBT community. On June 10, 2013, Irving revealed that his next novel, his 14th, will be titled Avenue of Mysteries after a street of that name in Mexico City. In an interview the previous year, he had revealed the last line of the book: "Not every collision course comes as a surprise." Simon and Schuster confirmed that they will publish this novel, which is tentatively scheduled for 2015. On December 19, John Irving posted a message on the Facebook page devoted to him and his work that he had "finished 'Avenue of Mysteries.' It is a shorter novel for me, comparable in length to 'In One Person.'" Irving speculated that "if everything remains on schedule, the English-language editions should be published in fall 2015." Simon & Schuster subsequently scheduled "Avenue of Mysteries" for publication in November 2015. As we grow older —- most of all, in what we remember and what we dream —- we live in the past. Sometimes, we live more vividly in the past than in the present. Avenue of Mysteries is the story of what happens to Juan Diego in the Philippines, where what happened to him in the past —- in Mexico —- collides with his future. On November 3, 2015, Irving revealed that he'd been approached by HBO and Warner Brothers to reconstruct The World According to Garp as a miniseries. He described the project as being in the early stages. In 1964, Irving married Shyla Leary, whom he had met at Harvard in 1963 while taking a summer course in German, before traveling to Vienna, Austria with IES Abroad. They had two sons, Colin and Brendan, and divorced in the early 1980s. In 1987, he married Janet Turnbull, who had been his publisher at Bantam-Seal Books and is now one of his literary agents. They have a son, Everett. Irving has homes in Vermont, Toronto, and Pointe au Baril. Irving was diagnosed with prostate cancer in 2007 and subsequently had a radical prostatectomy. In 2010, Irving confirmed that he is a second cousin of Amy Bishop, an assistant professor at the University of Alabama in Huntsville, who is serving a life sentence for shooting six colleagues, killing three, during a department meeting on February 12 of the same year. ↑ Garp won the 1980 award for paperback general Fiction. From 1980 to 1983 in National Book Awards history there were dual hardcover and paperback awards in most categories, and multiple fiction categories, especially in 1980. Most of the paperback award-winners were reprints, including this one. ↑ Bachelor of Arts in 1965. 1 2 3 Smith, Dinitia (June 28, 2005). "While Excavating Past, John Irving Finds his Family". The New York Times. Retrieved September 10, 2014. 1 2 Schäfer, André (2012). "Le Monde selon John Irving". Arte. ↑ Klaus Brinkbäumer (May 21, 2010). "Zehn Wahrheiten von ... John Irving; "Ich bin gerannt und hab mir den Block gegriffen"". Spiegel Online. ↑ Mel Gussow (April 28, 1998). "A Novelist Builds Out From Fact to Reach the Truth; John Irving Begins With His Memories". The New York Times. Retrieved November 7, 2009. ↑ "National Book Awards – 1979". National Book Foundation. Retrieved 2012-03-14. ↑ "National Book Awards – 1980". National Book Foundation. Retrieved 2012-03-14. (With essays by Deb Caletti and Craig Nova from the Awards 60-year anniversary blog. ↑ See e.g., Irving's NYT article A Soldier Once about Grass' autobiography Peeling the Onion, July 8, 2007. 1 2 Boyd Tonkin (October 23, 2009). "Cooking up a storm: John Irving's latest saga reveals the secrets of authors and chefs alike". The Independent. London. Retrieved November 5, 2009. ↑ Solomon, Even (1999-12-17). "John Irving's movie business". Hot Type. Toronto: CBC Archives. Retrieved 2015-11-07. ↑ Ariel Leve (October 18, 2009). "The world according to John Irving". TimesOnline. London. Retrieved November 4, 2009. ↑ "National Wrestling Hall of Fame". Retrieved November 4, 2009. ↑ "John Irving's personal thoughts on Simon Birch". September 7, 1998. Retrieved November 6, 2009. ↑ "John Irving's Facebook Page". June 10, 2013. Retrieved June 10, 2013. ↑ Kevin Haynes (November 4, 2015). "John Irving novel to become an HBO miniseries". Purple Clover. Retrieved November 5, 2015. ↑ Peschel, Joseph (8 November 2015). 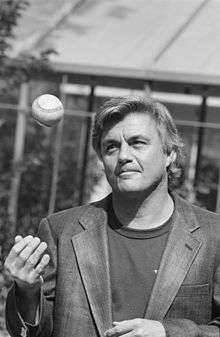 "John Irving revisits odd characters, circuses, orphanage in new novel". St. Louis Post-Dispatch. ↑ Kim Hubbard (July 30, 2001). "Hands Full". People. Retrieved November 4, 2009. ↑ R.Z. Sheppard (August 31, 1981). "Life into Art: Novelist John Irving". Time. Retrieved November 4, 2009. ↑ Benjamin Svetkey (May 22, 1998). "Widow Maker". Entertainment Weekly. Retrieved November 4, 2009. 1 2 3 4 5 Ariel Leve (October 18, 2009). "The world according to John Irving". The Sunday Times. London. Retrieved November 4, 2009. 1 2 Boyd Tonkin (October 23, 2009). "Cooking up a storm: John Irving's latest saga reveals the secrets of authors and chefs alike". The Independent. London. Retrieved November 3, 2009. ↑ Boris Kachka (October 11, 2009). "Call of the Wild". New York. Retrieved November 4, 2009. ↑ Meghan E. Irons (February 17, 2010). "Ala. slay defendant is related to novelist John Irving". Boston Globe. Retrieved February 21, 2010.